NORTH BAY — Appearing overnight between Mulligan Street and Marshall Avenue, an enormous ad for Vic Fedeli temporarily closed down parts of Lakeshore Drive this morning. Measuring over 90 feet high, the placard – which features a younger, smiling Fedeli – blocked off all four lanes of traffic. The gridlock included several school buses, two ambulances, and one man on a unicycle. The gigantic PC Party advertisement stood proud and unabashed against the morning sun – a bright blue brazen billboard – before falling over and killing six people. 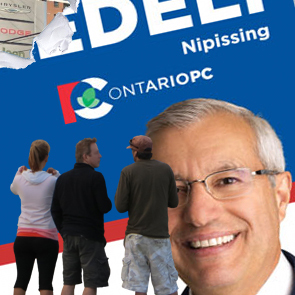 Fedeli was not reachable for comment, but local PC rep Kris Hibbert did offer some insight. On the six people crushed by the sign, Hibbert appeared unphased.